Does anyone know the best media for a true story of international interest ? Some newspapers might pay more than others, some, very little , and some nothing at all ,I imagine. Although that is not really the most important issue, more of where the best publicity would come from . Daily Mail, Express, BBC, Women' s Magazines, ( although it's nothing to do with women ) , just an idea and a bit of direction would be helpful. You normally do it through a press agency giving them an outline, they pitch it out to their contacts who make you offers or buy it themselves. Reuters used to be the one for international stuff but I doubt there is much in it between them and the press association these days. Pitching to a non-uk company could be fraught. Readers Digest seems to publish stories from all over.Maybe worth having a look into them Granny.. Readers Digest, Cools. I'd forgotten about that, my dad used to get them every month (I think it was) After he died, he being a collected of things , we were facing about 30 yrs of them ! before we got to them. Ha ! My Dad also had the readers digest for years. This token was his, i presume for getting them for so long. 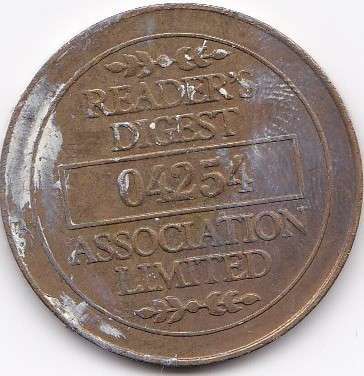 Readers Digest grand prize draw token, it used to be a battle between Readers Digest and Which Magazine who could run the most audacious prize draw scheme. 04254 was the number that most people got. Some of these draws used to last years for the same prize and even have different promotions (summer draw, winter draw etc but it was the same draw). Then there was the plethora of junk you received on approval for you to be entered into the draw that you invariably sent back.